71% out of 300 women agree. Let that sink in a little. Would this sway you into buying a skin care product now that so many women endorse it? No, I didn’t think so and that dear intelligent blog reader is because you know what I know and that 71% (213) of 300 women works out at 0.0000143177% of the UK population of women between the ages of 15 and 65. But then again so is everything. Petrol often features in the news, currently its around the £1.30’ish per litre but did you know that the price is minuscule when compared to say something like printer ink. Many moons ago when ink jet printing was in its infancy I remember filling up a colour ink jet using separate cartridges, they were big cartridges too holding 250ml of ink and costing £4 each. A few years later and a new printer arrived in the office, it too had separate colour cartridges only this time they cost £10 each and £12 for black but ran out very quickly. It was soon discovered that they had only 40ml in each one. Last year I ditched my home colour ink jet because the cartridges were way too expensive at nearly £40 for a four colour set and each colour had only 4ml inside. I could of course bought cheap alternatives but from experience I’d end up with a lot of head cleaning as a consequence. When you work it out Petrol comes out at 0.0013 per ml whilst printer ink comes in at a whopping £2.50 per ml and it gets worse, the reduction in the regular size has meant they can now offer a better ‘value’ XL ink cartridge for a slightly higher price. It still comes in the same cartridge they have just filled it up a bit more with coloured ink (water!) back to what it was before! Statistics and perceptions are constantly challenged, one massive indicator that you are about to be mislead is a change in packaging. 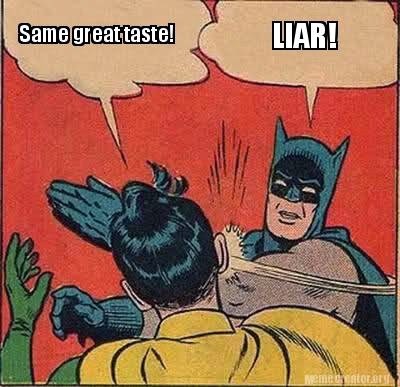 Companies don’t change packaging lightly so no matter how much something says ‘Still the same great taste!’ or ‘Better Than Ever!’ from my experience its all a ruse to cover something up. We use a popular type of shower gel that comes in a range of colours, last year when we went to top them up we noticed the packaging had changed, some of the names had changed and the price had gone up. When we inquired we were told it was to take into account the new European laws regarding packaging. What a load of rubbish, when we got home we compared like for like and true enough not only had the packaging changed but also had the colour, smell, name and of course its ability to produce bubbles, a favourite brand had cheapened out a little. Anyway why this blog today? Well, it’s all about cheese. The packaging has changed on my favourite cheese, it still tells me that nothing has changed and its the same great flavour only it’s gone up a little in price. I like cheese, cheese has been a staple of mine for as long as I can remember (spare the jokes about me being cheesy) cheese and pickle, cheese and cucumber with brown sauce sandwiches, specialty cheeses, artisan cheeses I have tried them all so don’t lie to me about my current favourite cheese! Normally when I cut it you get a small but firm crumble to it, now it sticks together like plastic, not only that but the pack is still the same size but I now get 350g instead of 400g for my money. It also tastes different and here’s the test; melts differently, always a sign that some of the fat content has been jigged around with. So naturally I’m disappointed in a unpleasy cheesy kinda way and that gets me in a frame of mind to see facts and figures for what they really are. If I’m unhappy about something I start to see other things I am unhappy with such as hair adverts and ink cartridges. So today I’m having a facts and figures free day to help or so I thought until I started to write todays blog. Aarrgh! At least I’m not going to inadvertently glance in a shopping trolley like yesterday and have an image burned on my retina, I went to bed and had a nightmare of a nurse beating me to death with an oiled cucumber. I woke up comparing toothpaste tubes.